Recruited by the Blues from neighbouring amateur side Brunswick Juniors in 1916, Charlie Canet played finals football in each of his five completed seasons at Princes Park. Canet was born in country Victoria, in a place called Tallygaroopna which is located north of Shepparton. A lightly-framed, tenacious wingman, he was appointed vice-captain of the club in 1920, and captain the year after. But after just six matches in charge in 1921, Canet stood down from the role after an apparent altercation with his coach Norman Clark. He left Carlton later in that same season, and took up a big offer to coach country club Nathalia. The Canet family history traced its arrival in Australia to Charlie’s grandfather, Robert Canet; a 17 year-old crewman who jumped ship from an English trading vessel at the Melbourne docks during the height of the Victorian goldrush. Robert made his way to the gold fields, struck it rich, and eventually bought a farm in northern Victoria. By 1915, Robert’s grandson; Charlie, was in Melbourne, playing impressive football for Brunswick Amateurs. Carlton soon took notice, and early the following year Canet made his senior debut for the Blues in a nail-biting 5-point win over Richmond at Punt Road. At first, Charlie played in a back pocket that afternoon, before coach Clark realised that he was much more valuable further up field. Throughout the rest of his time with the Blues, Canet rarely played anywhere else but the wing. 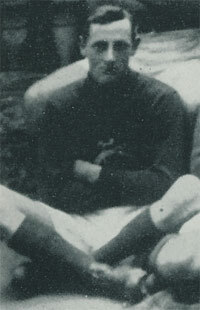 Canet’s best season was 1920, when he was appointed vice-captain to Charlie Fisher, and enjoyed a consistent year alongside champion centreman Rod McGregor. Then in July, Fisher was injured, and relinquished the captaincy. But instead of appointing Canet in Fisher’s place, Norman Clark gave that honour to centre half-back Paddy O'Brien, with Charlie remaining as his deputy. Clark was a strong-willed and forthright character, and not always the most tactful, so it is easy to conclude that Canet would not have appreciated the manner, or the circumstances of his rejection. However, Carlton still made it all the way to the Preliminary Final in 1920, only to lose to Collingwood in a gruelling contest on a wet and heavy MCG. O’Brien and Canet battled hard all match trying to lift their side to victory, but Collingwood’s little men couldn’t be contained, and the final margin of 24 points flattered the Blues. Afterward, Paddy O’Brien rekindled the flame of antagonism between Clark and Canet when he in turn stood down as captain. Charlie Canet assumed the role at last, but there can be little doubt that resentment lingered on. When season 1921 got underway, the tensions between Clark and Canet seemed to have eased, especially after the Blues first six matches brought three wins, two draws and a bye to give Charlie an unblemished record as captain. That was until the week prior to round 7, when Carlton sprung yet another surprise by announcing that Canet had been replaced by Gordon Green as captain of the Blues. The real circumstances of this fourth change of leadership in less than twelve months was never made public, but it was obvious that Canet’s position at Carlton was by then untenable. At 25 years of age, as a former VFL club captain with 79 games experience, Charlie Canet was hot football property, and it didn’t take long for the offers to roll in. Eventually, he decided to head for Nathalia in northern Victoria, where the prospect of employment, housing and a minimum salary of eight pounds a week to captain-coach the local team compared very favourably with his pay packet of five pounds a week at Carlton. Canet played his eightieth and last match for the Navy Blues in August 1921, when Carlton comfortably accounted for South Melbourne at Princes Park. All four of the club’s most recent captains; Green, Canet, O’Brien and Fisher, were in the side that afternoon, when Norman Clark coached the side to a 25-point win. After that, Charlie Canet went to Nathalia, and eventually settled in the district. When World War II began in 1939, he signed up at the age of 47 to spend two years serving with a Docks Operating Company of the Royal Australian Engineers. He came home safe and well, and lived out his remaining years in the bush before passing away in 1978, at the age of 82. Charlie Canet was appointed playing coach of the Sale Football Club for the coming season. The last two seasons he was the coach of Nathalia, and they had not been in the finals for 13 years. In 1922 Nathalia were runners up, and were premiers of the Goulburn Valley competition in 1923. Mr.Canet will be employed as an assistant in Mr. Loughnan's billiard parlour. Charlie Canet was appointed as Carlton Reserves coach for the 1940 season. Charlie had previously coached Nathalia, Maffra, Sale, and Kyabram with all clubs reaching the finals under his leadership. Contributors to this page: Jarusa , molsey , Bombasheldon , blueycarlton , PatsFitztrick , WillowBlue , p(12)terg , keogh , true_blue24 and admin . Page last modified on Tuesday 15 of January, 2013 09:36:38 AEDT by Jarusa. 1990 - Peter Dean;s hardest opponent.